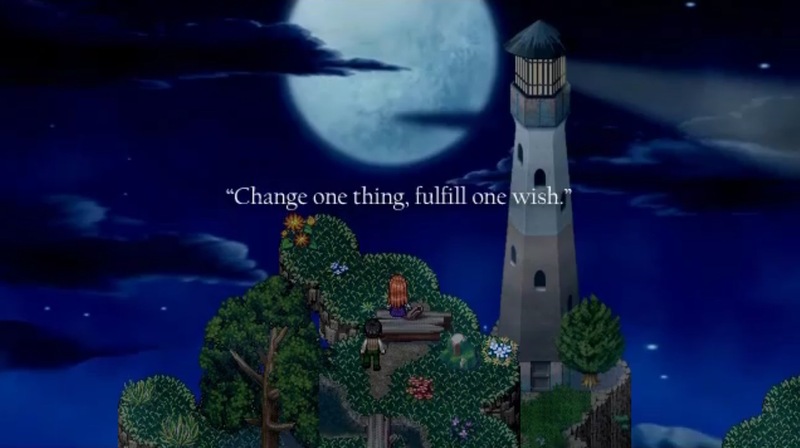 To the Moon is a 4-5 hour game from the creative mind of Kan Gao of Freebird Games, that takes you on a emotional roller coaster through a deep story, rich characters, and seemingly fantastic locations. The fourth game to come from Kan, it’s certainly one of his best, and easily tugs at your heart strings and makes you want to play more and more to conclude the epic story. You start To the Moon playing as a pair of scientists(/doctors/employees? Who knows, they’re in white doctors jackets so they must be important) that accidentally get into a car accident on their way to a old, drying man. You make your way up the hill where you crashed, to find a huge house on the cliff edge overlooking the sea and a lighthouse. The characters you control acknowledge that this was the place they were meant to be, and proceed inside. From here, the story is explained; the characters you play as are agents that can fulfil a patients dying wish using some kind of device that alters a persons memories. In order to make this wish a reality though, they need as much information as possible about the patients life, be it memories, or physical world possessions, in order to build up a complete picture and change the right memory to make sure the patient believes their wish came true before passing away. It sounds weird, but it is all executed beautifully, allowing you to look back through a persons life and feel proper attachment to the characters Kan Gao makes. I won’t say anything more on the story, as I feel it’s the core of the whole game, and saying anything would spoil the greatness you feel as you explore and learn the story for the first time. The game is made using RPG Maker, a weird little engine that isn’t very flexible, but gets the job done for telling stories in a RPG themed way. It was this choice of engine that started my first hurdle to playing To the Moon: it wasn’t available on Mac. Not a biggie I thought to myself whilst in America, I’ll just play it on my PC when I get home, which couldn’t be further from the truth. On my PC, I couldn’t get the screen to work, meaning the game just sat there, playing the music but without any picture. After checking around online, people suggested pressing ctrl + enter to exit from full screen, which worked, but my god was that window tiny! It barely took up the left corner of my monitor. I tried playing like this for a few hours, but it was just too tiny to truly get immersed in the game. In the end, I used windows magnifier to zoom in on where my cursor was, and for the most part, this sorted my problem. It’s a shame that a game as great as this suffers from little kinks like this that dramatically detract from the core game itself. It’s comparable to when Simcity launched and people couldn’t play it due to the servers being down, which may sound harsh for such a small studio, but we all make choices, and Kan Gao’s choice was to make the game using RPG Maker, which became a detriment to myself and many others experiencing his game. It’s for these very reasons that I wasn’t able to capture screenshots or video. In conclusion, I hugely recommend To the Moon to anybody out there that has a heart or a keen interest in storytelling in games. The rich characters and depth of story make for a truly unique experience, one which had me shedding a few tears and wanting more, something I haven’t had from AAA games for a while. Whilst RPG Maker wasn’t the best choice in making this game, it certainly didn’t detract from making Kan Gao’s imagination a reality.